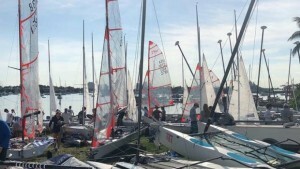 Twenty-four teams competed in the first of two events being used to select the US 29er teams to represent USA in the 2019 Youth World Sailing Championships (Gdynia, Poland). Held February 16-18, Canada also chose to use it for their qualifying with teams ultimately attending from across the US, Canada, and the US Virgin Islands to compete in Miami, FL. Stephan Baker and Oliver Duncan dominated the 10-race event with only one race outside the top two, finishing 14 points ahead of the second place team of veterans Berta Puig and Bella Casaretto (2018 Youth Worlds Girls Silver Medalists). Ripley Shelley/ Nicholas Hardy finished 28 points off the lead in third place. 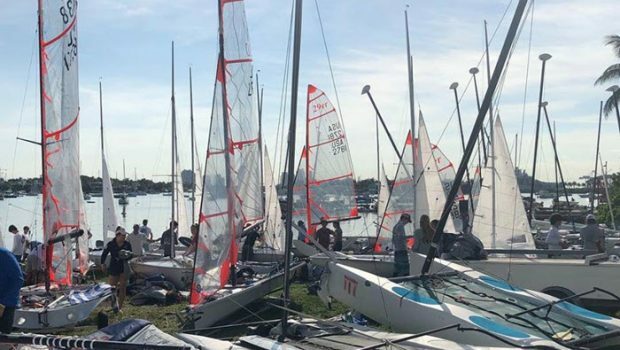 The next event in the winter calendar is the 29er Midwinters East event (Miami, FL) on March 16-17 but the real attention is on 29er Midwinters West (Coronado, CA) on March 22-24 where the second and final part of the qualifier series takes place.